Lying at the fringes of a tide of regeneration currently transforming much of London’s East End, Homerton appears to be next in line for a large injection of private and public investment. 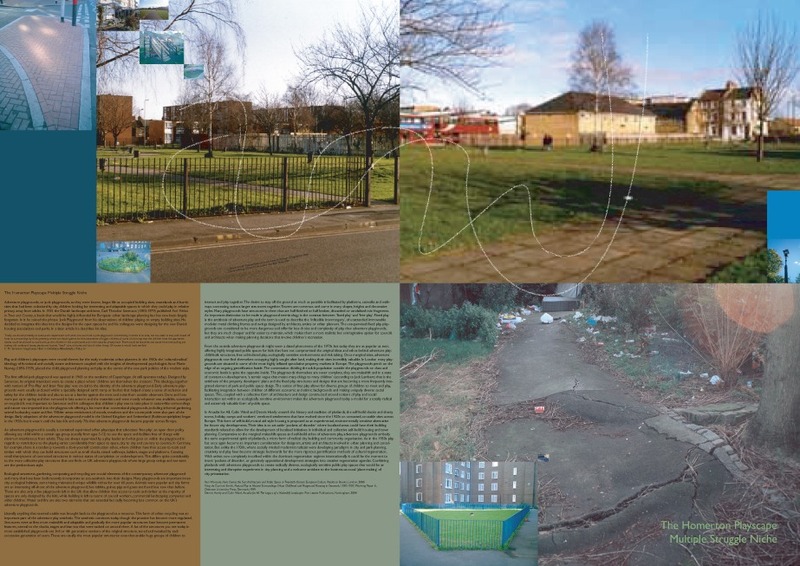 Addressing issues such as the use of public space, town planning and the provision of adequate play areas for children, Norman’s project proposes a timely, fantastic and radical regeneration strategy for the area. Nils Norman proposes a sprawling extension to the Homerton Grove Adventure Playground, encompassing the space surrounding the playground. The proposal takes the form of a drawing depicting an expansive network of play areas, connected by an intricate system of towers and walkways. 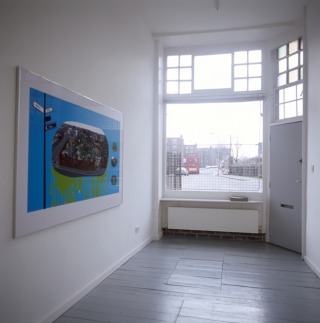 The drawing has been produced as a large print, which can be seen at the City Projects gallery and as a foldout poster, which is available from local businesses and community organisations. The back of the poster contains a short essay by the artist on the history of adventure playgrounds. 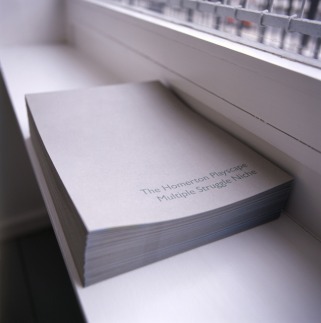 Also on show at the gallery is the Multiple Struggle Niche Library, an idiosyncratic yet informative collection of books on radical urban design, regeneration and the rise of the so-called ‘creative industries’. ‘Finally we should probably at some point experiment with what one could call a junk playground. I am thinking in terms of an area, not too small in size, well closed off from its surroundings by thick greenery, where we should gather, for the amusement of bigger children, all sorts of old scrap that the children from the apartment blocks could be allowed to work with, as the children in the countryside and in the suburbs already have. There could be branches and waste from tree polling and bushes, old cardboard boxes, planks and boards, “dead” cars, old tyres and lots of other things. Of course it would look terrible.’ C. Th. Sørensen: ‘Etagehusets Have’ in Arkitektens Månedshœfte, 1935, p 61. Play and children’s playscapes were crucial themes for the early modernist urban planners. In the 1930s the ‘cultural-radical’ ideology of functional and socially aware architecture coupled with the insights of developmental psychologist Anne Marie Nørvig (1893-1959), placed the child, playground planning and play at the centre of the new park politics of the modern style. The first official junk playground was opened in 1943 on the outskirts of Copenhagen. (It still operates today). Designed by Sørenson, its original intentions were to create a place where ‘children are themselves the creators’. This ideology, together with notions of ‘Pro-Play’ and later ‘free play’ was crucial to the identity of the adventure playground. Early adventure playgrounds were usually enclosed within a specially designed earth ramp or bushes that helped create a sense of seclusion and safety for the children inside and also to act as a barrier against the mess and noise from outside observers. Dens and huts were put up in spring and then removed in late autumn and the materials used were mostly whatever was available, scavenged or recycled. It was important to Sørenson and his colleagues that children’s play was to take place in nature-like surroundings and nature was imported into the playgrounds offering a lot more than conventional playgrounds, including informal gardening, animal husbandry, water and fire. Wilder areas reminiscent of woods, meadows and the countryside were also part of the design. Early adoptions of the adventure playground model in the United Kingdom and Switzerland (Robinsonspielplätz) began in the 1950s but it wasn’t until the late 60s and early 70s that adventure playgrounds became popular across Europe. An adventure playground is usually a contained supervised urban playscape that advocates ‘free play’, an open door policy allowing any child within a certain age group (usually from ages 5-12) to use the space and facilities free of charge with minimum interference from adults. They are always supervised by a play leader and what goes on within the playground in regards to restrictions to the playing varies considerably from space to space, city to city and country to country. In Germany, for example, there is a tendency towards a do-it-yourself construction ethos, where children have free access to tools and timber with which they can build structures such as small shacks, raised walkways, ladders, stages and platforms, creating small shantytowns of connected structures in various states of completion. This differs quite considerably from the more collective play structures that one finds on UK adventure playgrounds where large group swings and seesaws are the predominant style. Ecological awareness, gardening, composting and recycling are crucial elements of the contemporary adventure playground and many that have been built recently have incorporated an eco-aesthetic into their designs. Many playgrounds are important inner-city ecological habitats, some having maintained unique wildlife niches for over 60 years. Animals were popular and city farms are an interesting off-shoot of the adventure playground, but rabbits, guinea pigs and goats are found less now than before. There are also only a few playgrounds left in the UK that allow children free access to tools and timber as the majority of spaces are only designed by the kids, while building is left to teams of council workers, commercial landscaping companies and older children. Water and fire are also two elements that are essential but sadly becoming less common on the UK’s adventure playgrounds. Literally anything that seemed usable was brought back to the playground as a resource. This form of urban recycling was an important part of the adventure play aesthetic. The aesthetic continues today though the practice has become more regulated. Structures were at first more makeshift and adaptable and gradually the more popular structures have become permanent features, central to the shacks, stages and lean-tos that were tacked on around them. A lot of the structures you see today in more established playgrounds are 3rd or 4th generation versions of the original structure, tuned and tweaked by each successive generation of users. These are usually the most popular structures: ones that enable huge groups of children to interact and play together. The desire to stay off the ground as much as possible is facilitated by platforms, catwalks and walkways connecting various larger structures together. Towers are numerous and come in many shapes, heights and decorative styles. 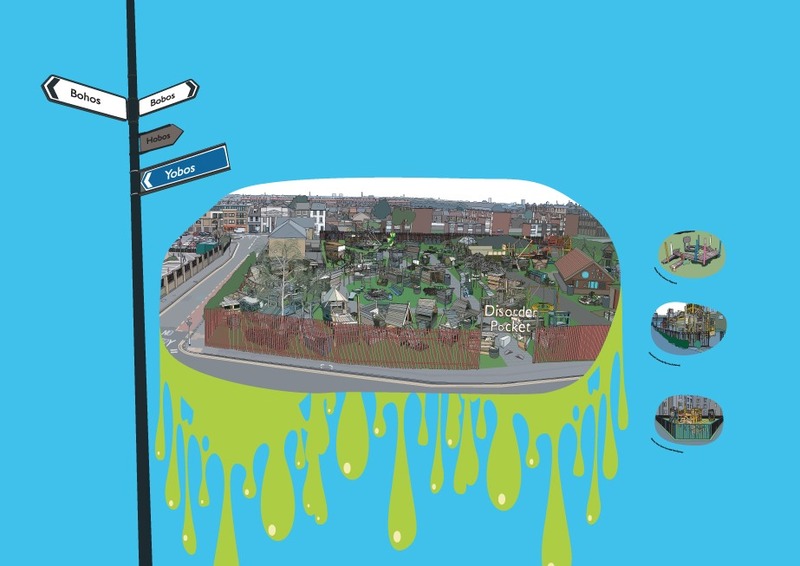 Many playgrounds have structures in them that are half finished or half broken, discarded or vandalised ruin fragments. An important distinction to be made in playground terminology is the contrast between ‘fixed play’ and ‘free play’. ‘Fixed play’ is the antithesis of adventure play and the term is used to describe the ‘inflexible ironmongery’, of unattended immoveable modular metal climbing frames and swings designed by architects, artists or urban planners. The unsupervised fixed play playgrounds are considered to be more dangerous and offer far less choice and complexity of play than adventure playgrounds, but they are much cheaper and far easier to maintain, which makes them a more realistic but unimaginative option for councils and architects when making planning decisions that involve children’s recreation. From the outside adventure playgrounds might seem a dated phenomena of the 1970s but today they are as popular as ever, offering highly integrated public spaces for kids that have not compromised the original ideas and ethos behind adventure play: child-built structures, free unhindered play, ecologically sensitive environments and risk taking. Once marginal sites, adventure playgrounds now find themselves occupying highly sought after land, making their sites incredibly valuable. In London many playgrounds are situated in some of the most highly inflated speculative property markets in Europe. The playgrounds perch on the edge of an ongoing gentrification battle. The contestation dividing the adult population outside the playgrounds on class and economic levels is quite the opposite inside. The playgrounds themselves are never complete, they are makeshift and in a state of constant un-development, ‘a terrain vague that means many things to many children’ (according to Jack Lambert) that is the antithesis of the property developers’ plans and the fixed play structures and designs that are becoming a more frequently integrated element of park and public space design. The notion of free play allows for diverse groups of children to meet and play, facilitating integration between children of different economic and ethnic backgrounds and making uniquely diverse social spaces. This, coupled with a collective form of architecture and design constructed around notions of play and social interaction set within an ecologically sensitive environment makes the adventure playground today a model for a totally radical and extremely valuable form of public space. In Arcadia for All, Colin Ward and Dennis Hardy unearth the history and tradition of Plotlands, the self-build shacks and shanty towns, holiday camps and workers’ week-end settlements that have evolved since the 1920s on unwanted, unusable sites across Europe. This form of self-build, mutual aid style housing is proposed as an experimental, environmentally sensitive alternative for future city developments. 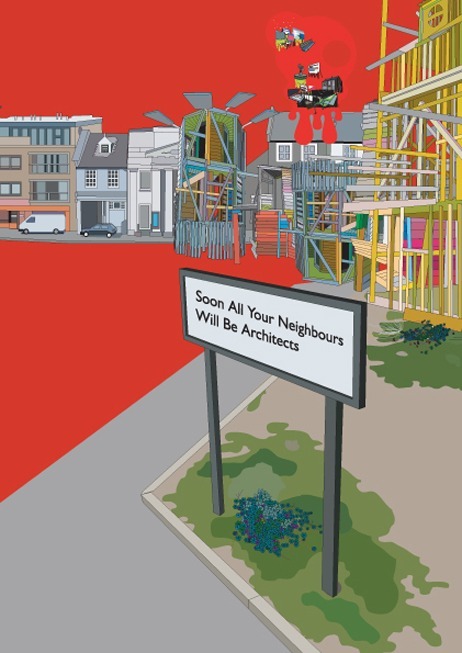 Their idea is to set aside ‘pockets of disorder’ where localised areas could have their building standards relaxed to allow for the development of localised initiatives in individual and collective self-build housing and town planning. Comparative to the marginal makeshift spaces and self-build ethos of adventure play, adventure playgrounds embody the same experimental spirit of Plotlands, a micro-form of radical city building and community organisation. As in the 1930s play has once again become an important consideration for designers, artists and architects involved in urban planning and consultation. But unlike the 1930s, where socially minded modernist radicals were developing paradigms in city and park planning, creativity and play have become strategic buzzwords for the more rigorous gentrification methods of cultural regeneration. With artists now completely inscribed within the dominant regeneration regimes internationally it could be the moment to insert ‘pockets of disorder’, or genuinely oppositional development strategies into creative regeneration agendas. Combining Plotlands with adventure playgrounds to create radically diverse, ecologically sensitive public play spaces that would be an interesting and disruptive experiment in city planning and a welcome antidote to the business-as-usual ‘place-making’ of city privatisation. Natural Play in Natural Surroundings: Urban Childhood and Playground Planning in Denmark, 1930-1950.